Well, do I need to say anything about the weather. Useless. No observing during the July/August New Moon period. But it did clear and I did decide to go out to Kumeu, despite the nearly first quarter Moon. Packed the car and drove out just after the rush hour traffic, but found that I had forgotten my Observatory keys. Doh. Luckly Steve was home and I was able to get in the gate. No real goals tonight, just going to use this evening to get continue getting used to the Argo Navis. DUN 144 Star 98x Equally bright double star. Tight separation. DUN 146 Star 98x Equally bright double star, one star is orange, one is white. Loose separation. DUN 154 Star 98x Double star, one star is a fraction brighter than the other, both are white. Moderate separation. In the FOV of theta Centaurus. HJ 4578 Star 98x Unequal double star, the bright star is white, the fainter one is a muted orange white. Moderate separation. HJ 4600 Star 98x Fairly equally double star, one star is orange and bit brighter, the other white. Moderate separation. HJ 4601 Star 98x Small equally bright double star. Moderate separation. HJ 4614 Star 98x Small equally bright double star. NGC 104 Globular Cluster 98x Despite being low down it the south on a moonlight night, 47 Tuc has good resolution and clarity. NGC 4337 Open Cluster 98x Small compact open cluster, fairly difficult to determine structure due to the Moon glow. Tucked next to a line of 3 10th Mag stars. Nice equally bright yellow double in the FOV. NGC 4349 Open Cluster 98x Fairly large loose open cluster. 100 to 120 members. Has a bright star in the field on the W side. NGC 5286 Globular Cluster 98x Brightish, partially resolved globular cluster. Moderately condensed, possibly Type 5 globular. NGC 5927 Globular Cluster 98x Bright compact globular cluster, partially resolved. Rather loose in structure. On the Lupus / Norma border. NGC 5946 Globular Cluster 98x Small compact globular cluster, in a very starry field. NGC 5986 Globular Cluster 98x Bright, partially resolved, globular cluster. Fairlt loose concentration. Has a 7th Mag star just to the E.
NGC 6352 Globular Cluster 98x Globular cluster in Ara. Farly large and very loose, contrast does affect this object. NGC 6362 Globular Cluster 98x Bright southern globular on it's way to being resolved. Loose but rich. In Ara, but well south of the Ara Asterism. In a notch of Ara, between Triangulum Australe and Pavo on the border with Apus. I never remember this object. NGC 6752 Globular Cluster 98x Quick look at the Pavo Glob. Good resolution here as well. Largely unaffected by the moon. M 27 Planetary Nebula 98x Good look at the Dumbell, well defined despite moonlight. M 57 Planetary Nebula 98x First good look at the Ring for this year. Good resolution, needs a better night and a little more height. M 71 Globular Cluster 98x Compact Messier globular cluster, nearly resolved and loose. In a profusely starry field. Jupiter Planet 98x Had a look at Jupiter, good detail in the bands. No Jovian phenomena tonight. All four moons were visible. Used the variable polariser to cut glare. Works very well. Nice crisp view of the Moon tonight. Phase is just about 1st Quarter, with the terminator at about 6 deg E.
Most of the detail noted is on Page 34 of Rukl. 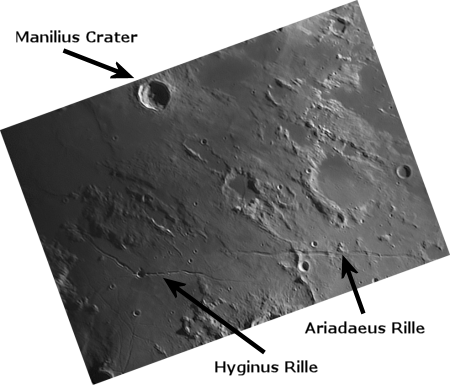 Manilius crater was experiencing glancing light at dawn, giving a real 3D effect. Also in the same region is extensive rilles, Hyginus and Ariadaeus. Image below shows area observed. Had a good two hours out. All systems worked well. Had a look at a few double stars in Centaurus, until I got bored of those (pretty quickly) and moved onto some open clusters in Crux and some southern globulars. Nothing serious. Had a look at some northern Messier objects as well. To finish with it was nice to have a good look at the Moon as well. Some excellent detail. Anything faint like galaxies etc were just not much chop. Dave Moorhouse turned up at just before 9PM, by then I was looking at the Moon and Jupiter through the Variable Polarising Filter. Packed up and was on the road home by 9:15 PM.